PENSACOLA, Fla. – July 14, 2016 – Mustang Club of America, the largest Mustang enthusiast organization in the world will celebrate its 40th anniversary at the iconic Indianapolis Motor Speedway by attempting to break the record for the world’s longest Ford Mustang parade on Friday, Sept. 2nd. The parade will feature Mustangs and MCA clubs from around the world as it stretches from Indianapolis Motor Speedway at turn 2 to Gasoline Alley and 16th street. Tickets for the parade are available online for pre-registered attendees. All proceeds from the event will go towards benefitting CHERUBS and Riley Children’s Hospital. The current record held by the Mt. Hood Mustangs and Fords Club, featured 766 Mustangs at the Woodburn Dragstrip on April 12, 2014. Authorities from the Guinness Book of World Records will be on site when MCA breaks that record. 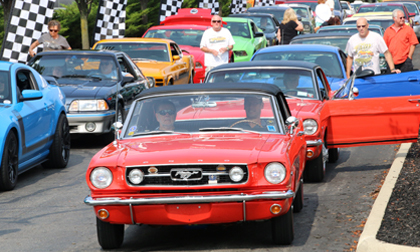 Throughout the weekend, Mustang enthusiasts will have plenty of full-throttle activities to enjoy. In addition to MCA’s Guinness Book of World Records efforts, other activities over the weekend will include track sessions, vendor displays, demonstrations and MCA’s annual banquet with special guests and honorary speakers. In 1976, 30 Ford Mustang enthusiasts responded to an Atlanta newspaper ad inviting them to a meeting at the Antique Car Museum in Stone Mountain, Georgia. The first meeting of the Mustang Club of America had 13 Mustangs in the parking lot while the 40th Anniversary is expected to draw more than 1,000 Mustangs. The club has grown to over 13,000 members in more than 190 chapters worldwide holding multiple National judged events around the country each year. Details continue to be finalized for the event. Information is continuously updated on a special website, http://www.mca40th.com/ and at the MCA website, http://www.mustang.org/. The Mustang Club of America is a non-profit organization dedicated to the preservation, care, history, and enjoyment of all model years of Mustang, Shelby, Boss, Saleen, Roush, SVT Cobra, Steeda, and McLaren. Membership includes enthusiasts throughout the United States, Canada, and worldwide and more than 190 Regional Clubs.